Mindful walking may sound a bit strange to some… yet, the first time i ever tried it I fell in love with it. Not only was it so much easier than sitting meditation – it was so much fun! Who’d have thought that you could combine meditation and doing things you love like walking? Once I discovered this little gem then I knew I was on a winner. If you’re a tad curious about how mindful walking works and more importantly how you could give it a go yourself, then keep reading below. I’ll give you a real simple breakdown on the key things you can focus on to feel like it’s working for you. 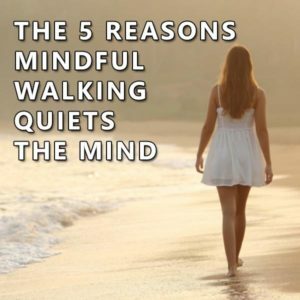 Here’s my top 5 reasons why anyone can learn to walk mindfully and why it helps to quiet the mind. 1. You can do it anytime and anywhere. Mindful walking is so simple to do once you get the knack of it that you can do it walking around your home or office, walking to your letterbox, walking the dog or walking anywhere at all. I recommend that you start with just 5 to 10 mins and if possible somewhere relatively quiet – just until you get used to it. 2. It’s easier than sitting meditation. It’s natural for the mind to speed up when you sit down to meditate because it has less to be distracted by, especially as your eyes are closed. Walking meditation tends to provide a much greater sense of ease and spaciousness than sitting meditation. 3. It’s an simple way to become familiar with how meditation works. Having your eyes open and moving your body while meditating makes practicing meditation for many people a whole lot easier. It serves a powerful bridge between meditation practice and everyday ordinary activities. 4. It makes it simpler to train your mind to be present. Imagine being able to train your mind to be present while walking – how might this change your life? Being present requires giving your mind something to pay attention to that exists in the here and now. That’s why walking is perfect as there is an abundance of things for you to be aware of with every step you take. 5. There are multiple ways to walk mindfully. From what you can see and hear, to what you can smell and feel you can enjoy it all when walking mindfully. When you start out it’s good to take a moment to notice as much as you can that is going on around you. The wind, the sun, the buildings, the people, the traffic, the noises – notice it all. Practice noticing these things without any judgment or interpretation of them. My default place to focus my attention while walking is on my feet. I focus on the rise and fall of my feet as they connect with the ground. While this is happening I am also aware of where I am walking, what is going on around me and anything that may potentially be hazardous ahead or behind me. Also, when I notice that my mind is wandering I just gently bring it back to my feet touching the ground. Walk at the pace that feels comfortable for you. You don’t need so much to think about how you are walking, you just need to be aware of what’s going on around you. Once you get the feel for this then you can focus your efforts on walking mindfully in your everyday activities. Lastly, as you get more comfortable with walking this way you can try places that have more distractions. The secret here is to simply include whatever distractions are going on around you as part of your walk. Just by noticing dogs barking, or cars revving up, or the weather changing, you can allow them and come back to the sensations of your feet touching the ground.